Today I’m reviewing Cecelia and Fanny. 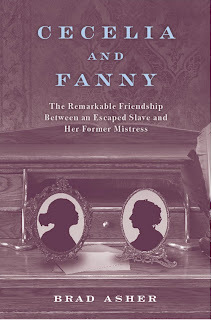 The Remarkable Friendship between an Escaped Slave and Her Former Mistress by Brad Asher. In the spring of 1846, twenty-year-old Fanny Thruston Ballard and her father, members of Louisville, Kentucky’s elite, were vacationing at Niagara Falls. They were accompanied by Fanny’s personal slave, a fifteen-year-old girl named Cecelia. One night, Cecelia made the bold decision to escape across the Niagara River into Canada, thus gaining her freedom. Over the next fifty years, Fanny and Cecelia went on to lead separate lives. During this time, both women married, raised families, and lost loved ones. The Civil War was fought. Both women dealt with its upheavals as well as the resulting changing economic circumstances. During this time also—surprisingly—the two women corresponded. Some of the letters (letters from Fanny to Cecelia) have survived. Using a variety of primary sources including these letters, census records, newspapers, government pension files and a host of others, Cecelia and Fanny reconstructs the lives of these women, situating them within the antebellum, Civil War, and post-war periods. The book is not an in-depth dual biography of these women—although we do learn a good deal about the framework of their lives. 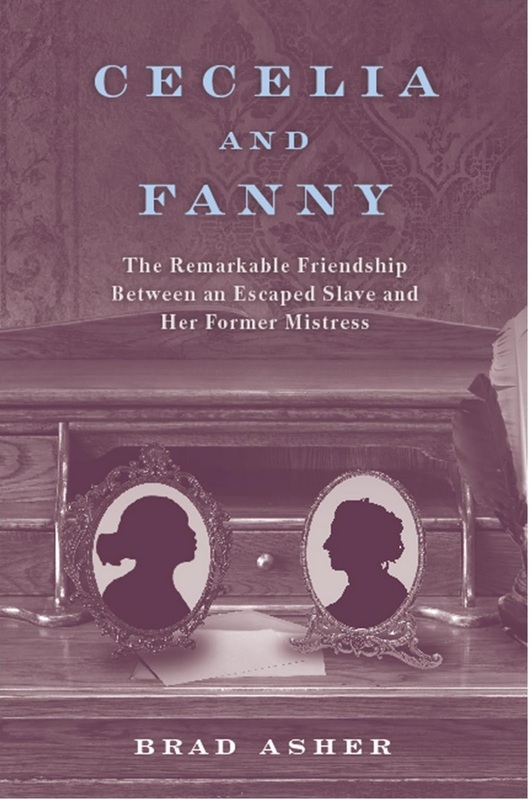 Rather it uses the relationship between Cecelia and Fanny, in all its phases—childhood companions, mistress and slave, pre-war ex-mistress and escaped slave, to post-war ex-mistress and free black woman—to tell a story about the tenacity of the bonds of slavery. Cecelia and Fanny were linked not just as slave to mistress but within interwoven families. Theirs was an intricate web of connections: personal, economic, moral, and probably psychological. Along the way, the book also explores Louisville history (Fanny’s environment) during the second half of the 19th century, as well as that of the free black communities in Toronto and Rochester, NY (Cecelia’s environments) during the same time. Cecelia and Fanny is more than a book about a slave’s escape to freedom. What makes this book unique is that the principal characters were based in Kentucky, a Union state during the Civil War. Moreover, Cecelia was a domestic slave in an urban environment, not a plantation worker. She escaped while already in Niagra Falls, with freedom a visible goal—Canada just across the river. There was no harrowing story of her flight. Her harrowing adventure begins after she has obtained freedom. Another interesting feature is that the story of Cecelia’s life includes the Civil War. She was not emancipated by it – she had taken that step herself. And yet, the war’s successful conclusion gave her the freedom to move back to Louisville. She moved back to the city where she had been a slave. The letters are an interesting springboard to much larger questions. Who were these women? What was their relationship that this slave and this mistress would be writing to each other years after the slave ran away? By placing the two women within their historical and cultural context, this book addresses questions of slavery, freedom, and womanhood with insight and sensitivity and helps us to imagine the perspectives of these two very different women at this pivotal point in history. Of course, I think the writing is wonderful and the research impeccable, but how could I think otherwise? The book is now available. You should be able to obtain it from your local indie bookstore or online bookseller. The kindle or nook versions won’t be available until Oct.7. The winner of the Cecelia and Fanny Giveaway chosen using random.org is Sam from Tiny Library. Congratulations! Hosted by Jill at Breaking the Spine, Waiting on Wednesday is a weekly event. Bloggers can share news of books that they are eagerly awaiting. The release day is October 4. I'm debating whether to pre-order it or whether to try to read it on my Nook. I'm not crazy about reading off the Nook -- I'm not used to it yet. But one way or another, I'll be getting my hands on this book! Mailbox Monday is a meme originated by Marcia at A Girl and Her Books. It's now being rotated through different blogs monthly. During September, Mailbox Monday will be hosted by Amused By Books. Bloggers can share info about the new books that have come into their homes during the week. It's a great way to learn about MORE books to add to your wish lists and TBR piles. I've always thought the Children's Crusade would make a great historical novel for kids and/or young adults. 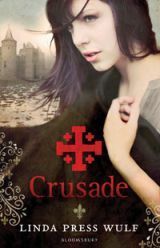 Evidently, Linda Press Wulf thought so too, because she wrote Crusade, published this year by Bloomsbury, UK. I've been trying to get a hold of a copy for awhile without luck, then once again remembered The Book Depository. It just arrived. I want to read it for the YA historical fiction challenge so I hope to get to it soon. Here's the back jacket copy: When a dazzlingly handsome boy riding a white charger arrives in Georgette's village, she is spellbound - both by the boy and by the crowd that surrounds him. They are all children. The boy is even more entrancing when he speaks. He seeks volunteers to join his Crusade - a perilous mission from which some may not return. Georgette has never left her village before, but she knows she will follow the boy. And so begins a journey filled with terrible danger, sacrifice and true love, a journey which will take all of Georgette's courage to survive. 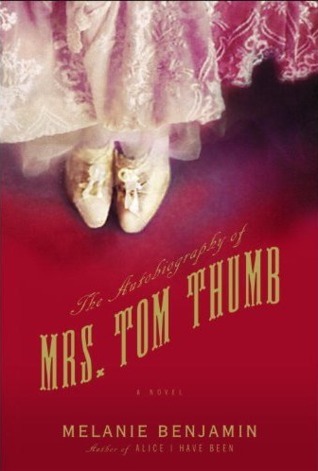 But what shocked me was that there on the nearly bare shelf was a single copy of The Autobiography of Mrs. Tom Thumb by Melanie Benjamin, a new release that I want very much to read. It was 80% off. And I had a gift card that was about to become worthless. The book ended up costing me 95 cents which is appalling, really. Anyway, my TBR pile is getting bigger instead of smaller, but I'm really looking forward to these two! 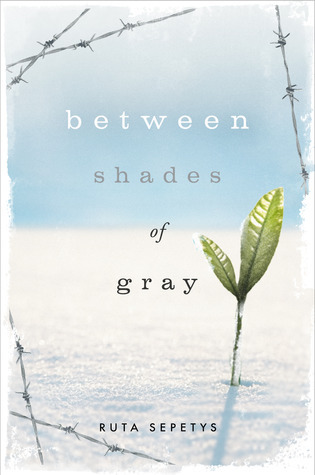 I just finished a wonderful YA historical, Between Shades of Gray by Ruta Sepetys. It looks at WWII from an entirely different angle, one I knew almost nothing about. Certainly I hadn’t understood the depth and breadth of the cruelty attending the Soviet occupation of the Baltic states of Lithuania, Latvia and Estonia. In an effort to suppress supposed anti-Soviet activity, anyone suspected of harboring anti-Soviet sentiment (teachers, lawyers, doctors, writers, artists, librarians, military men, businessmen, etc.) were placed on a list to be deported. Deportations began in the summer of 1941. Men, women, and children were shipped to Siberia under conditions so barbaric that the majority did not survive. Lina’s mother is a generous, strong, woman who doesn’t judge others– she looks for the good. Her kindness is an inspiration to those around her. She moves forward out of the need to keep her family together and because of she believes she will one day be reunited with her husband. Lina has more trouble seeing the good in people. She pours out her emotions in her art – art that she has to hide because it depicts the truth of the atrocities the Soviets are committing. Within their tiny community is a boy about Lina’s age, Andrius. He, too, has lost his father. Andrius is drawn to Lina. Their growing (and blossoming) friendship is one ray of hope that Lina clings to, giving her strength and purpose to survive. The story is intricately, painfully detailed. It’s a compelling read – even though I knew that reading more was just going to make me feel worse, I couldn’t stop. I had to keep going until something good happened. There were tiny nuggets of kindness and friendship among the suffering that give you hope for humanity. But overall it paints a pretty bleak picture. This is a fascinating story and an important one. This history is real and shouldn’t be forgotten. This is another book that I read for the YA historical fiction challenge. It was an emotionally powerful read and I learned some important historical facts. Highly recommended! I didn’t used to read much WWII historical fiction, but for some reason, ever since The Book Thief, I’ve been on a bit of a roll. 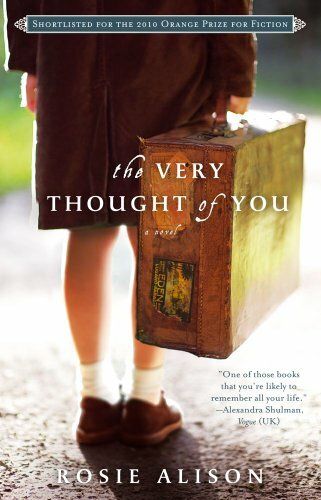 The latest book to catch my attention was The Very Thought of You by Rosie Allison. It was shortlisted for the 2010 Orange Prize for fiction and has received some nice reviews. However, my reaction to this book was mixed. Anna is sent to Ashton Park in the North Yorkshire Moors. Thomas Ashton and his wife Elizabeth have opened up their large estate to 86 children. They’ve hired staff and turned it into a boarding school, a safe haven. Anna is homesick but settles into her new life at the school. There, she develops an admiration for the patient, nurturing Mr. Ashton – an admiration that will influence the rest of her life. Thomas and his wife have a difficult relationship. Thomas is a courteous, gentle, and thoughtful man. However, he was crippled by polio and now is confined to a wheelchair. Elizabeth is beautiful and passionate. Unfortunately, she is barren and more than anything else, she wants a child. Disappointment has made her hard and brittle. Their relationship has been strained to the breaking point by these unresolvable crises. If they had loved strongly enough they might have been brought closer together by their mutual sorrow, but now, their marriage is falling apart. The book follows the characters over four years of the war and beyond, up to the present. Anna is a confused and reluctant witness to the disintegration of the Ashton’s marriage. The story examines infidelity from just about every imaginable angle. And so this is where I end up with mixed feelings. It’s an interesting enough story about flawed people and a study of marriages going awry. But I was expecting a war time love story. (It’s billed as "not just a love story but a story about love.") This seemed more a story of lack of love than a beautiful love story to me. There was a love story buried in there somewhere, but it wasn’t one I found particularly inspiring. It was sort of...well...tawdry. And the wartime setting was just background. The characters could have been just as miserably trapped in their marriages in any setting with a little tweaking of the plot. However, Anna’s story was nevertheless compelling. I was surprised, and a little disheartened, to see how it all played out in her life after she left Ashton Park. For me, this book was more interesting as a study of the ripple effects of infidelity than as a love story. There is a lot to recommend The Very Thought of You, even if I did find it downbeat and a rather depressing view of human romantic relationships. Where did the week go? It's already time for another book blogger hop. The blogger hop is hosted by Crazy-for-Books. If you're a book blogger looking for new books to read, more blogs to explore, and to spread the word about your own blog, head on over to the hop and check it out. Be sure to follow the rules! 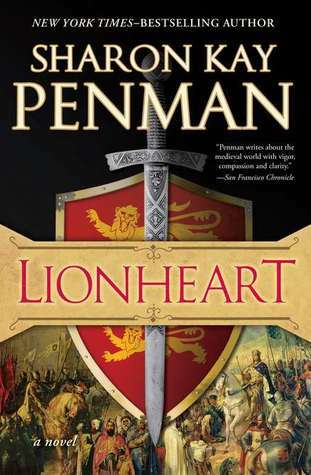 I mostly read historical fiction -- any time period but my favorite is medieval. 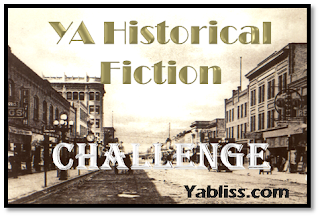 Historical fiction is my go-to read when I'm looking to relax, to escape -- I pretty much know that when I pick up one of these novels there's a good chance I'll enjoy it. I do read other genres though, a little bit of everything. If I was suddenly deprived of historical fiction, I think I would resort to the classics as my genre of choice, still with little bits of everything else sprinkled in. Why "the classics"? Because I have a to-read list that stretches out to infinity of classics that I want to read before I die. I'll never have time to get to them all. But if I couldn't read any more historical fiction, I could put a bigger dent in that classics pile. Daughter of Fire and Ice by Marie-Louise Jensen was a tricky book to get a hold of, until I remembered The Book Depository. With free delivery, and UK published books in stock, I don’t know why I don’t remember to use them more often. Thora is a beautiful fifteen-year-old healer and seer. Her talents have made her the target of Bjorn Svanson, the greedy young chieftain of her part of Norway. He has systematically reduced her father’s farm to the point where her father can no longer pay tribute. There is only one thing left for him to relinquish - her. But her family won’t let her go without a fight. However Bjorn has troubles of his own. King Harald is aware that Bjorn is keeping too much of the tributes for himself. The king’s army is on the march. Bjorn’s plan is to steal Thora and sail for Iceland. Thora has one chance for escape. Enlisting the help of a slave, a man she has seen before in her visions, she convinces him to steal the chieftain’s ship and his identity. Together, they might make a new life for themselves in Iceland. But they have to avoid their past – if they are caught it will mean ruin. And this is only one of their problems. They face starvation, disease, and a malevolent woman who not only sows discord among their small settlement but whose very presence destroys Thora’s hope for love. Daughter of Fire and Ice is a fast-paced, adventure-filled YA romance that will sweep you to back to the Viking era. Thora is a strong, no-nonsense heroine, well-matched by the newly-minted Bjorn Svanson, as they lead the settlers in the new land. They face adversity with strength and pit steady goodness against evil. Although you’re never really in doubt who’s going to win, it’s a thrill to go along for the ride. 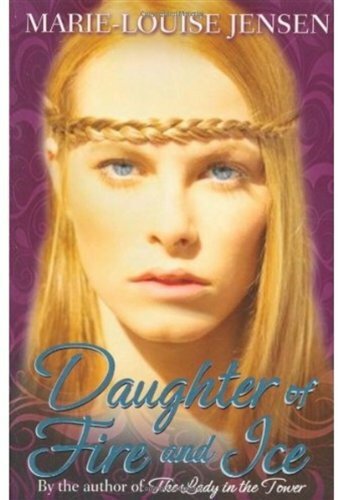 This is one of my YA historical fiction challenge books. If you you're a YA fiction fan, you can read reviews of other books I've read for the challenge (link at right) and check out the challenge at Yabliss.com. It’s Friday! Time to hop. Join us at the book blogger hop to meet other book lovers. The new book blogger hop, hosted by Crazy for Books , requires a back link to the hop post, so make sure you check out the post and follow the rules. And enjoy the hop! I'm looking forward to some time off. I have a bit of vacation time left to take, but my kids are back in school so we won’t be doing any fall traveling. Which leaves me just hanging out at home. Although it’s not a very exotic way to spend my vacation, it does mean I can get a lot of reading done! Once again, my loosely organized plan of attack for my TBR list was hijacked by a book I came across in a blog. 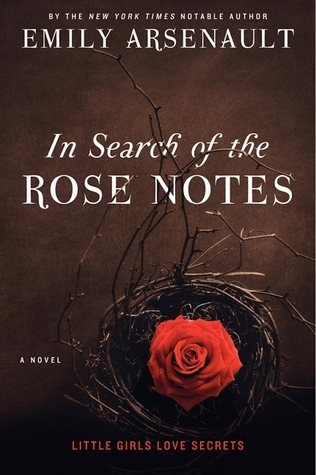 This time it was Sarah at Sarah Reads Too Much who gave a rave review to Emily Arsenault's In Search of the Rose Notes. Somehow the book jumped the line and got read out of turn. I don’t quite know how to characterize this book. At its core, it’s a mystery, but there is more too it than that. It's psychological study and plays on nostalgia and tween/teen angsty-trauma and real childhood pathologies. There's a whole lot packed in and it all works. Sixteen-year-old Rose went missing many years ago. Was she a runaway? Was she abducted? Murdered? Nora was eleven years old at the time, and the last person to see Rose before she disappeared. Rose used to babysit for Nora and her best friend Charlotte. Even after the police investigation turned up nothing, Charlotte and Nora continued to try to solve the mystery using psychic techniques pulled from a series of Time-Life books about the paranormal. But Nora wearies of the game because she knows Rose must be dead. Fifteen-ish years later, Rose’s body is found. Nora returns to her small hometown to face the unsolved mystery and unresolved issues of her fractured friendship with Charlotte. Through a series of flashbacks (alternating between now and back then), we relive Nora’s tortured adolescence. Was Nora’s isolation/depression a result of Rose’s disappearance or was it something else? (As she insists, she was weird before Rose’s disappearance, too.) As we meet more of the people from her past, we see how they were all affected in different ways. We also see how different the perspective becomes when a person is nearly thirty compared to when they were eleven. Or when they were in high school. The plot unfolds as secret after secret is laid bare. It becomes more complex as each character is absorbed into the mix. Their lives are interwoven as small-town, small world lives would be. The details are elegant–pulling the reader into the world. The characters are utterly believable. I don’t generally read "murder mystery" type novels because I don’t like gore and mayhem. This is not a blood-and-guts fest filled with sadistic murderers and on-the-edge-of-your-seat suspense. It was a different kind of suspense. I was intensely curious to see what had happened fifteen years ago to this teenage girl who inspired such devotion in her young charges. And after all the twists and surprises, I was satisfied with the answer.